Labuan Bajo is one of small town in Indonesia, so calm and beautiful. Labuan Bajo is one of small town in Indonesia, so calm and beautiful. The town is the gateway into the charm of Flores to complete travel from the west. However, if only want to enjoy the Varanus Komodoensis, which has been determined to be one of the World’s Seven Wonders of Nature, in its natural habitat. Labuan Bajo is an important starting point and the only one of the most convenient and comfortable. Different to other cities in Indonesia, Labuan Bajo has some uniqueness. First, it is a port city storied. Labuan is not a city with vast lowlands. The lowlands of the coast is not very widely followed slope that supports the vast plains on it. This condition creates a beautiful city landscape.Second, Labuan Bajo fortified by uninhabited small islands. The existence of islands creates the beauty of Labuan Bajo so it is no exaggeration to say that is beautiful city. Third, Labuan Bajo is a safe city. At least until now there has been no complaint from the tourists associated with pickpocketing or other criminal acts are synonymous with the urban world. So do not be afraid to come to Labuan Bajo. Beside to secure, you will also find hospitality of locals Flores. When you meet with others unknown though, the locals Flores always give a smile. You to respond to each other with a smile anyway did not impress to be haughty. Labuan Bajo is one of small town in Indonesia, so calm and beautiful. 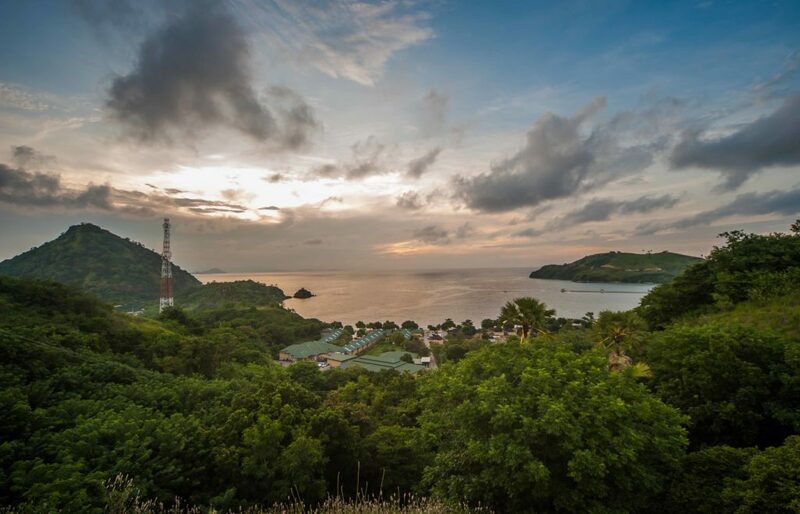 As Indonesia’s fastest growing regency, Labuan Bajo serves as the launching point to Komodo National Park. As we know, the natural habitat of Komodo become a magnet for tourist all over the world to visit Labuan Bajo. Komodo National park is only a few kilometers offshore, perfect for Diving, Snorkeling and Kayaking. Near Labuan Bajo waterfalls, caves and forest abound on Flores for the intrepid overland tourists. Further inland are found volcanoes, multi-colored lakes and even some Hobbits home. Labuan Bajo is one of small town in Indonesia, so calm and beautiful. The fastest access to get Komodo National Park via Labuan Bajo is by air. Whereas in the past, Komodo Airport – Labuan Bajo, only accommodate 400 passengers, now the service has been able to accommodate 700 passengers. With enhanced airport capacity, flight with a larger capacity can fly to Labuan Bajo, both of Denpasar and Kupang. Until now, there has been no direct flights from major cities in Indonesia to Labuan Bajo. To reach Labuan Bajo, flights must transit in Denpasar. Besides by air, Labuan Bajo can also be reached by sea. Pelni is one of the shipping company that serves sea trip to Labuan Bajo. Up to now there is no Pelni ships that have routes from Jakarta stop in Labuan Bajo. However, there are some Pelni that stop in Labuan Bajo. Among KM Wilis which stop in several cities of central Indonesia to Tanjung Perak Port – Surabaya. When to Labuan Bajo, you can use the ship from Surabaya – East Java. The route: Surabaya – Makassar – Bima – Labuan Bajo – Waingapu – Ende – Kupang. Then back Kupang – Ende – Waingapu – Labuan Bajo – Bima – Makassar – Surabaya. Moreover, Labuan Bajo visited KM Sirimau stop in several cities of central Indonesia to Tanjung Mas Port – Semarang. When to Labuan Bajo, you can use this ship from Semarang – Central Java. The route: Semarang – Batulicin – Makassar – Bima – Labuan Bajo – Makassar – Batulicin – Semarang. Labuan Bajo can also be reached by land. By using a private car, you can arrive in Labuan Bajo within 5-6 days. The route through Java – Bali is the last overland crossing Lombok and Sumbawa. From the easternmost tip of Sumbawa, precisely Sape Port, using Ferri that operate every day, you can reach Labuan Bajo within 6-7 hours.